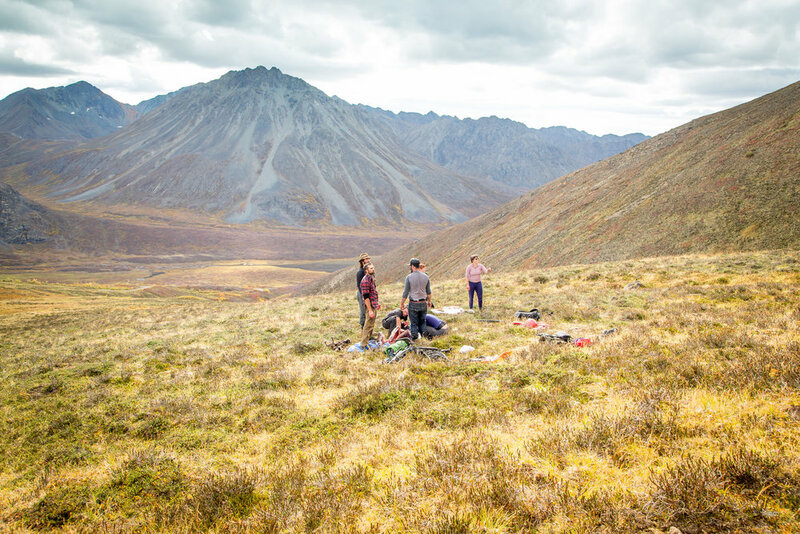 This fall I returned to the tundra of interior Alaska with a group of people to hunt caribou by human-power. 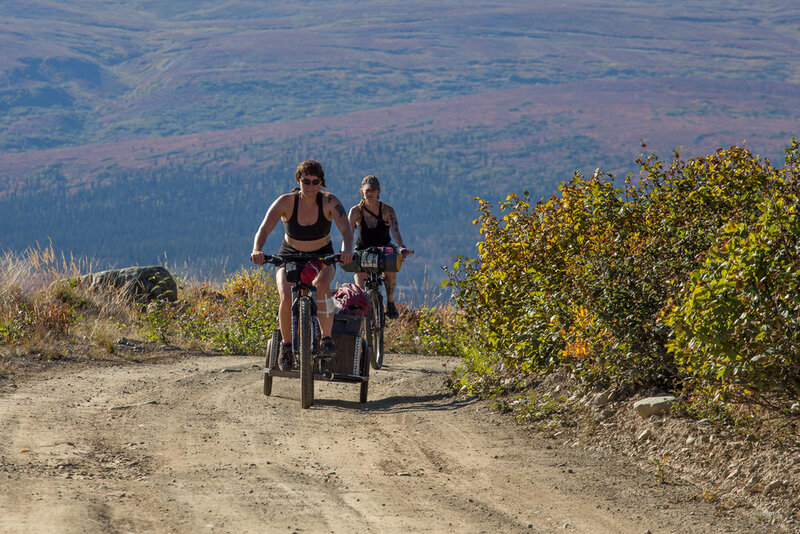 After meeting everyone in Anchorage, sorting the last of the gear, and coming up with our strategy, we drove north, parked our caravan, loaded bikes and trailers with camping gear, firearms and food, took a group photo, and pedaled toward the rising sun on a dirt road deep into a caribou rich valley. 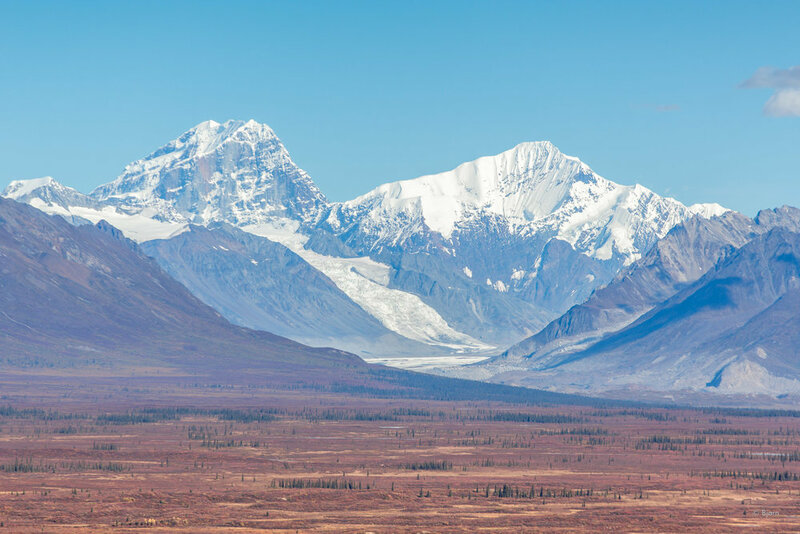 Few places are as beautiful as interior Alaska in the fall. 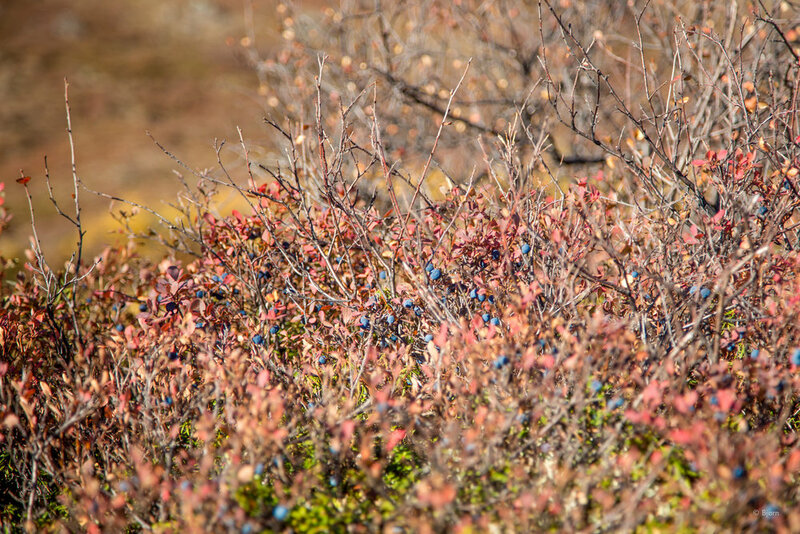 Dwarf willows turn red and yellow, berries fall off their bushes into your hand or bucket, glaciated peaks receive their first blanket of new snow and the air is crisp - immaculate even - and on it the aroma of labrador, cranberry, and a potpourri of lichens and tundra. Each sip or gulp of air stirs childhood memories and fills me with well being. Fall is the season for harvesting. The colors, aroma and frosty mornings ring the ancient alarm clock within and inspire action. Nearly 20 people joined this community hunt - each one a distinct, empowered individual worthy of lengthy description - motivated by the shared goal of filling freezers with the worlds healthiest animal protein, in a low impact manner, for the long winter months ahead. Human-powered hunting is hard. 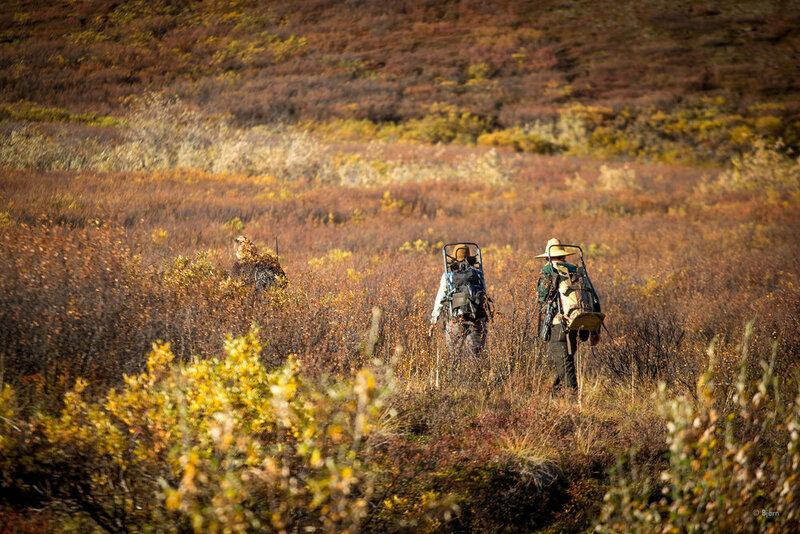 More hands help distribute the workload, and meat, on these hunting trips, is divided in the end by shares: one share for having a tag and dispatching an animal, one for field-dressing, one for hauling and one share for every 10 hours of butchering/processing. 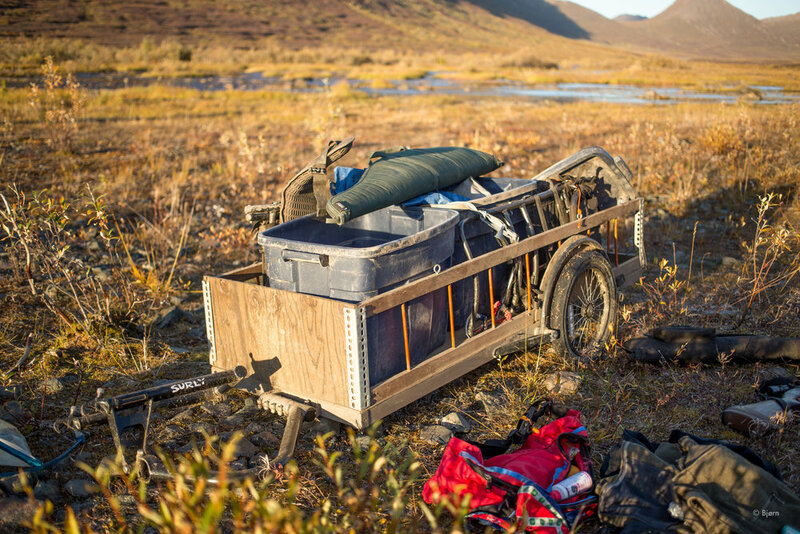 For three-days small hunting groups splintered into the hills and returned to camp with full frame-packs. When harvesting ended bikes and trailers made the back and forth trip several times until all the meat and hides were deposited. 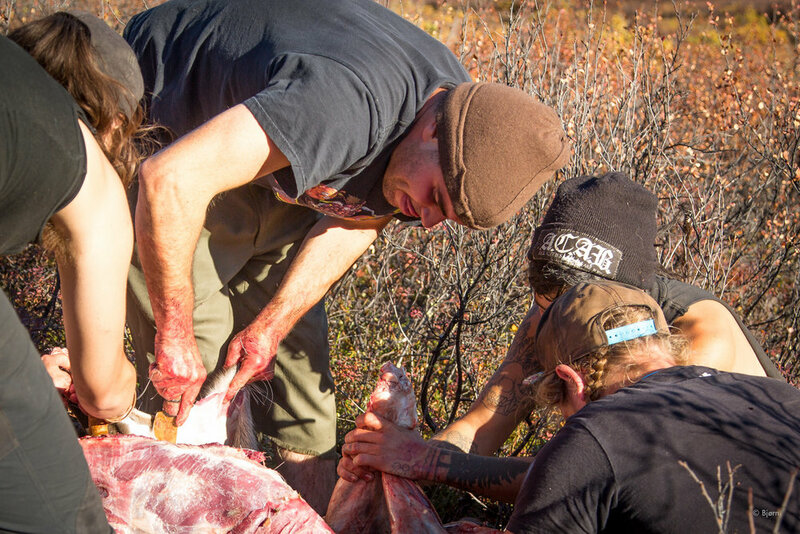 Back in Anchorage all hands worked round the clock for nearly four-days to properly butcher, proportion, grind, seal, can, and freeze the tundra bounty. At one point in the butchering process I stole away to meet with a man from Greenland, now living in Alaska. 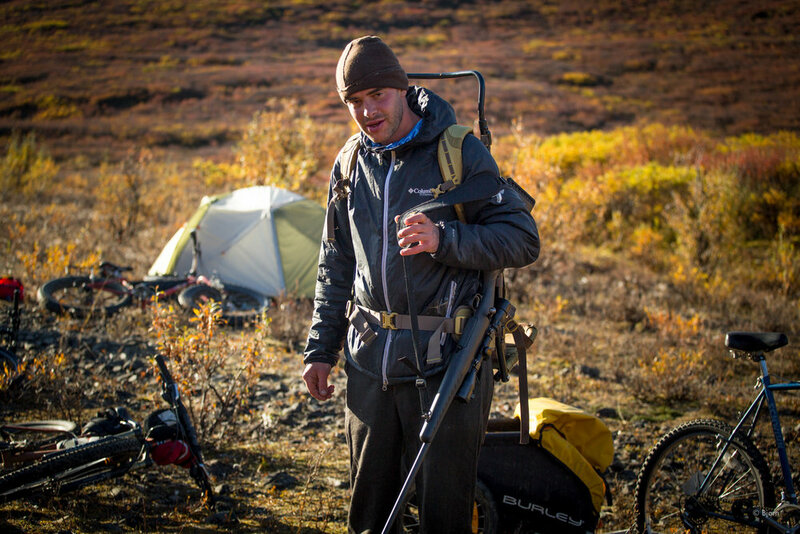 I wanted to interview him about human-powered hunting in his native country. 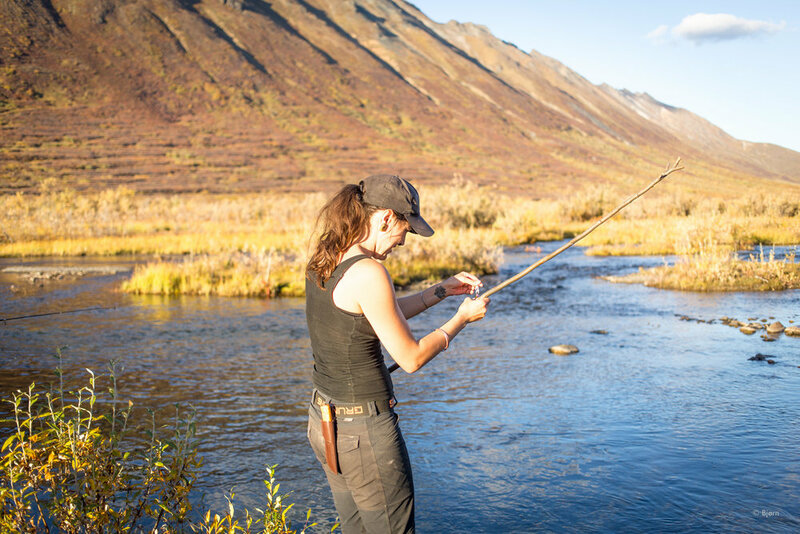 Maligiaq is an inheritor and instructor of several thousands of years of human-powered hunting tradition in a country that, like Alaska, has been modernized and colonized. 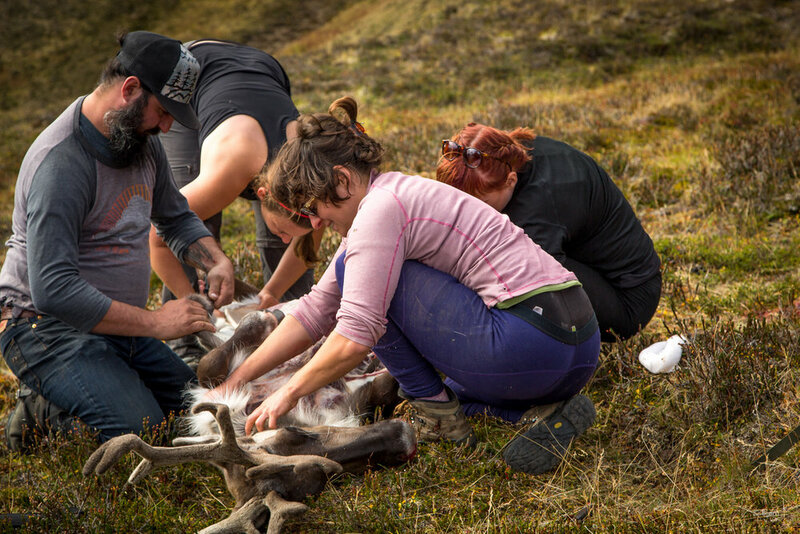 In Greenland, however, human-powered hunting is still the method. As a result, traditions and resiliency are strong and wildlife populations are abundant. I wanted to learn and hear from him. 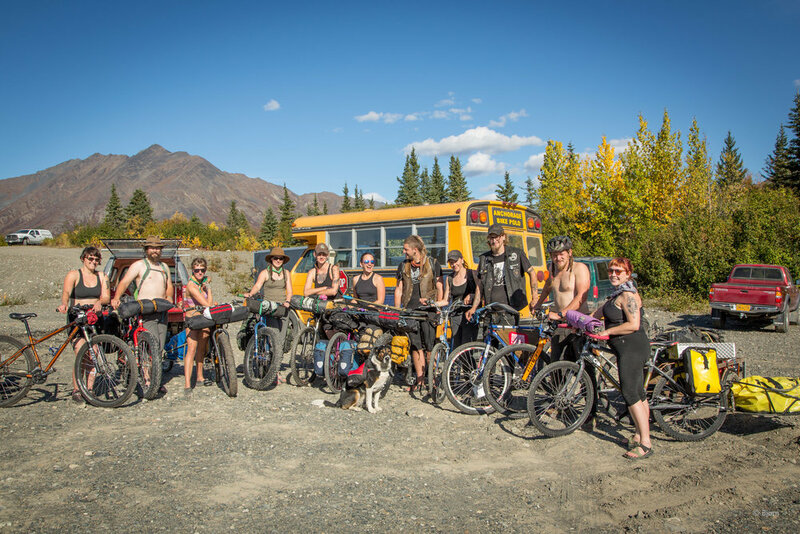 I'd like to believe that, in our small way, human-powered community hunts are demonstrating to ourselves and others that sustainable harvesting of wildlife is possible. For at least 90% of our evolution as an upright species we've been hunter/gatherers, and have only begun relying on fossil fuel technology to aid our hunts in the last century. 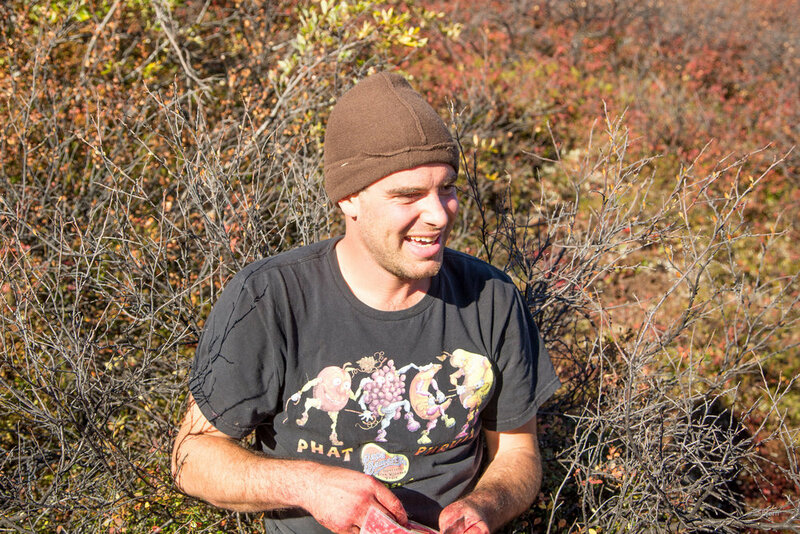 By hunting, growing food, and harvesting wild edibles I'd like to believe we can heal some of our sicknesses. By looking behind we can move ahead. "You can't spell meat without team." someone said, as we divided shares and said our goodbyes. Over the coming winter I and many others will eat meat filled with nutrition, meat filled with memories, and meat full of gratitude, community and resiliency. Note: Over the coming winter I will be working on a short film about this hunt.